From meal planning to dish duty, the Lodge 7-Piece Cast Iron Cookware Set equips car-camping chefs with durable essentials. The cast iron skillet and Dutch oven cook evenly and clean up in minutes. 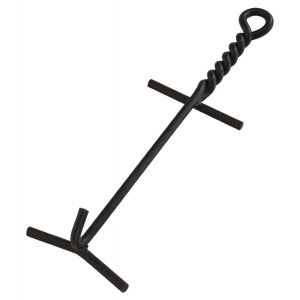 The heavy-duty Lodge Adjustable Camp tripod holds your pot over the campfire and adapts to fit any outdoor setting. Lodge Bear Cast Iron Skillet - 12"
This Lodge 12" cast iron skillet, with the exclusive bear design from the Lodge Wildlife Series, will be your favorite skillet for years to come, especially with its assist handle for easier handling. Lodge Camp Dutch Oven - 6 qt./12 in. Pre-seasoned so it's ready to go right from the start, the 6 qt. Lodge Camp Dutch Oven provides durable, reliable performance for all your campsite cooking. Outdoor cooking makes any meal an event. Spend less time scrubbing dishes and more time making S'mores! 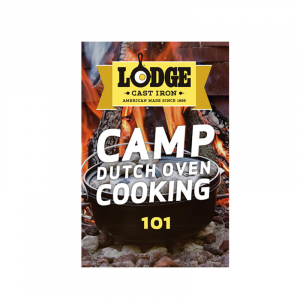 Lodge Camp Dutch Oven liners let you cook your meal, then toss the liners for lightning fast, water-free clean-up. A lid lifter is essential to safe Camp Dutch Oven cooking. Lodge Cast Iron Griddle - 10.5"
The round Lodge 10.5 in. Cast Iron griddle pan is the perfect tool for cooking pancakes, pizza or quesadillas. The slightly raised edges keep oil, batter and other ingredients neatly contained. Lodge Cast Iron Skillet - 10.25"
The heirloom black patina on this 10.25 in. Lodge Cast Iron skillet eliminates the time and effort of seasoning-it's ready to use right out of the box! Lodge Cast Iron Skillet - 6.5"
Whether you're scrambling eggs, baking cornbread or searing chicken breasts, this classic 6.5 in. Lodge cast iron skillet has you covered. Its smaller size doesn't sacrifice performance. 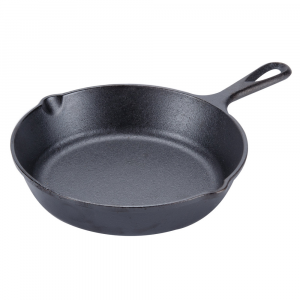 Lodge Cast Iron Skillet - 8"
The classic size for scrambled eggs or a batch of cornbread, the Lodge 8 in. skillet combines timeless design and flawless function. The classic size for scrambled eggs or a batch of cornbread, the Lodge 8 inch skillet combines timeless design and flawless function. Lodge Deep Camp Dutch Oven - 5 qt. Pre-seasoned so it's ready to go right from the start, the 5 qt. Lodge Deep Dutch Oven provides durable, reliable performance for all your campsite cooking. Lodge Deer Cast Iron Skillet - 10.25"
Hailed as an essential kitchen tool, this 10.25 in. cast iron skillet cooks up memorable meals for generations, with an exclusive deer design from Lodge Wildlife Series to add even more character. Lodge Duck Cast Iron Skillet - 8"
With timeless design and flawless function, this 8 in. cast iron skillet is the classic size for scrambled eggs or a batch of cornbread. And it sports an exclusive Lodge Wildlife Series duck design. Lodge Dutch Oven - 4 qt. The heirloom black patina on this 4 qt. Lodge Deep Dutch oven eliminates the time and effort of seasoning-it's ready to use right out of the box!